An author's unprofessional comments have drawn the attention of online artists. 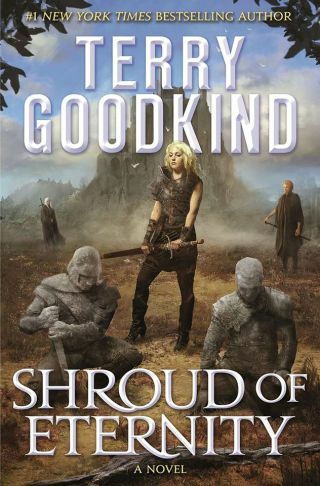 In a move that has baffled and annoyed artists, #1 New York Times bestselling author Terry Goodkind took to Facebook recently to insult the cover art of his latest book, Shroud of Eternity (above). Is it time for designers to leave Twitter? As well as describing the illustration by Bastien Lecouffe-Deharme as 'laughably bad' in a candid Facebook post, Goodkind invited his followers to share their opinions of the artwork by voting in a poll. Entrants could choose between 'laughably bad' or 'excellent', with a signed copies of the book up for grabs. It's a puzzling and unprofessional move that has provoked a huge backlash on Facebook and beyond. Fellow illustrators have come to the defence of Lecouffe-Deharme, with many pointing out that the artist would have been working to a brief so the problem really lies with the publisher. "The contest and poll below, is poking fun at my own book. The artist is obviously an exceptionally talented creative. The problem is with the publisher. I created the poll as a way to poke fun at the cover art, because it is a poor representation of characters within the book." He goes on to add "In no way do I feel the quality of the art is rendered poorly. For any misunderstanding, I apologize to the artist, his friends, and of course my own community here." Whether or not you buy this explanation probably depends on how you feel about Goodkind's decision to leave the original post and poll live on his Facebook page. In his defence, Goodkind says that he needs to follow-through with his promise of awarding signed copies of the book.